The Board of Directors of Hamilton Insurance Group, the Bermuda-based holding company for property and casualty insurance and reinsurance operations in the US, Bermuda and at Lloyd’s, today announced that, subject to approval by the Bermuda Department of Immigration, Pina Albo has been appointed to the position of Chief Executive Officer. Ms. Albo, who will join Hamilton from Munich Re on February 1, 2018, succeeds Interim Group CEO David Brown. Mr. Brown has held the executive position while a search was undertaken for a permanent replacement following Brian Duperreault’s departure in May. “It’s with great pleasure that we make this announcement today,” said Hamilton Chairman William Freda. “Our search for a new CEO has been robust and thorough, and we were delighted with the very high calibre of candidates we considered. “In the final analysis, all of us involved in the search were impressed by what Pina will bring to Hamilton: an accomplished career with extensive experience and contacts in the global insurance and reinsurance markets, a dynamic commitment to change in our industry, and a deep understanding of what we’re building at Hamilton. “I know I speak for our Board and senior management in thanking David for taking on the role of Interim Group CEO during this transitional period. “I want to thank the members of the executive team and all Hamilton employees for their hard work and dedication during a period of organizational change, and our brokers and clients for their continued strong support,” said Mr. Brown. “It’s an honour to be joining Hamilton,” said Ms. Albo. “I’ve been aware of what the Company has been doing over the last four years and its goal of leveraging data science and analytics to transform underwriting. “In particular, I’m proud to be given the chance to lead an organization establishing forward-thinking operations in the Bermuda and Lloyd’s markets and through its investment in Attune, the technology platform established by Hamilton in partnership with AIG and Two Sigma. Ms. Albo began her career as a lawyer in Toronto, Canada. After practicing in real estate, corporate finance and M&A, she accepted a position at Munich Re as a claims expert. 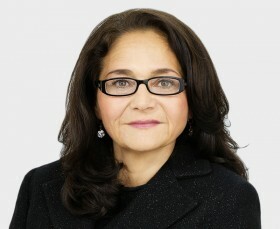 During her 25-year career at the Company, Ms. Albo has held increasingly senior positions which have included Head of Casualty Unit, North America/UK and International D&O/EPL; Head of Casualty Operations at Munich Reinsurance Company of Canada and Temple Insurance Company; Executive Head of Department UK and Ireland; President, National Clients Division, Munich Re America; and President, Reinsurance Division, Munich Reinsurance America. Ms. Albo’s most recent position at Munich Re is Member of the Board of Executive Management where her responsibilities have included P&C business and operations in Europe and Latin America. Ms. Albo has been a member of many industry boards including the Board of the Insurance Information Institute, the Board of the Reinsurance Association of America and the National Board of the Insurance Industry Charitable Foundation. She has been recognized for her contributions to the insurance industry and has received numerous awards including the Association of Professional Insurance Women’s “Woman of the Year” . She was designated a “Top Influencer” in Insurance Business America’s List of “Hot 100”  and placed in Intelligent Insurer’s list of ‘Top 100 Women in Re/insurance” [2014 and 2015]. Ms. Albo holds the Maîtrise en Droit, International and European Community Law, from L’Université d’Aix-Marseille III, Aix-en-Provence, France; Juris Doctor from Osgoode Hall Law School, York University, Toronto, Canada; and a Bachelor of Arts degree in Languages from the University of Winnipeg, Winnipeg, Manitoba, Canada.